Day 1 of the Novena, with Dom André Laberge, O.S.B. 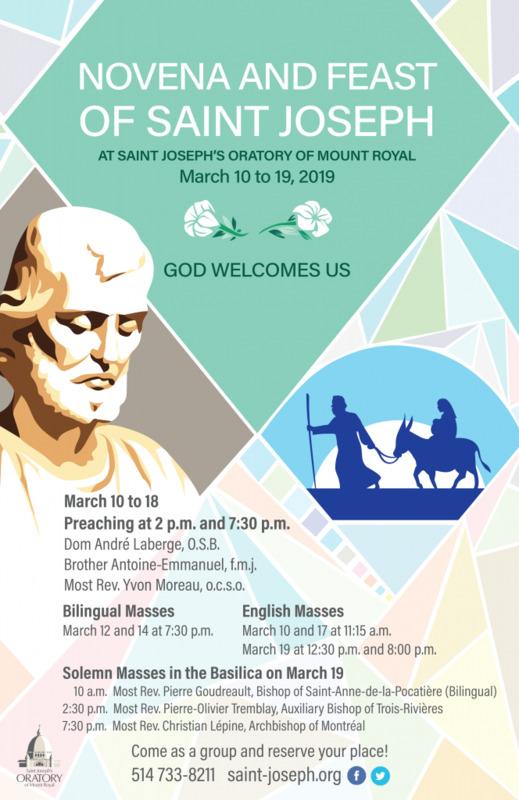 Preaching and Celebrations from Sunday, March 10 to Monday, March 18 in preparation for the Feast of Saint Joseph, Husband of Mary, on Tuesday, March 19, 2019.
you welcomed Saint Brother André. to those who approached him. like the Father who opened his arms to enfold his prodigal son. where all are invited to experience the immensity of your love. We ask this of you, our Father, through your Son, in the Spirit. Originally from Beauharnois, André Laberge entered the Abbey of Saint-Benoît-du-Lac in 1960 and was ordained a priest in 1969. He studied music at the Conservatoire de musique de Montréal from 1969 to 1972, then at the Conservatoire Regional Toulouse and Amsterdam, from 1977 to 1979. 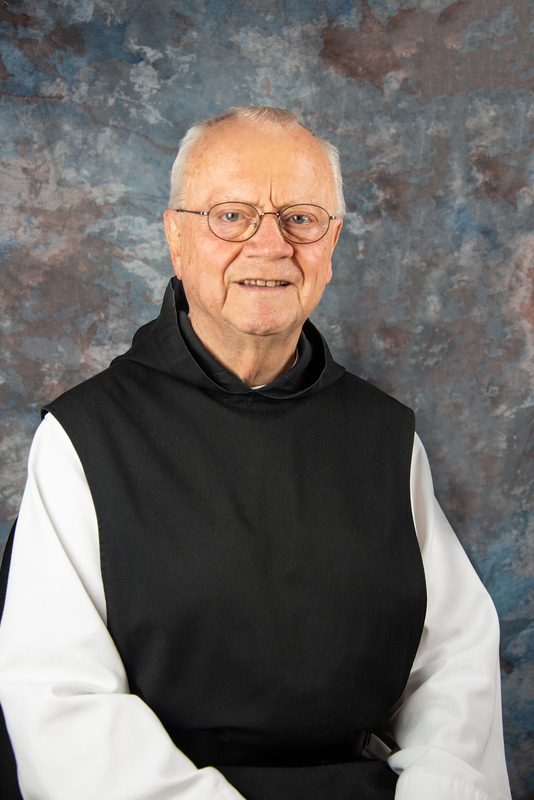 On his return to Quebec from among his Benedictine brothers, he served as Assistant Master to Novices, as Master of Novices and Cloistral Prior until his election as Third Abbot of Saint-Benoît-du-Lac in 2006. In addition to his monastic duties, Dom Laberge adds his musical contribution to the Abbey’s liturgy as an organist. 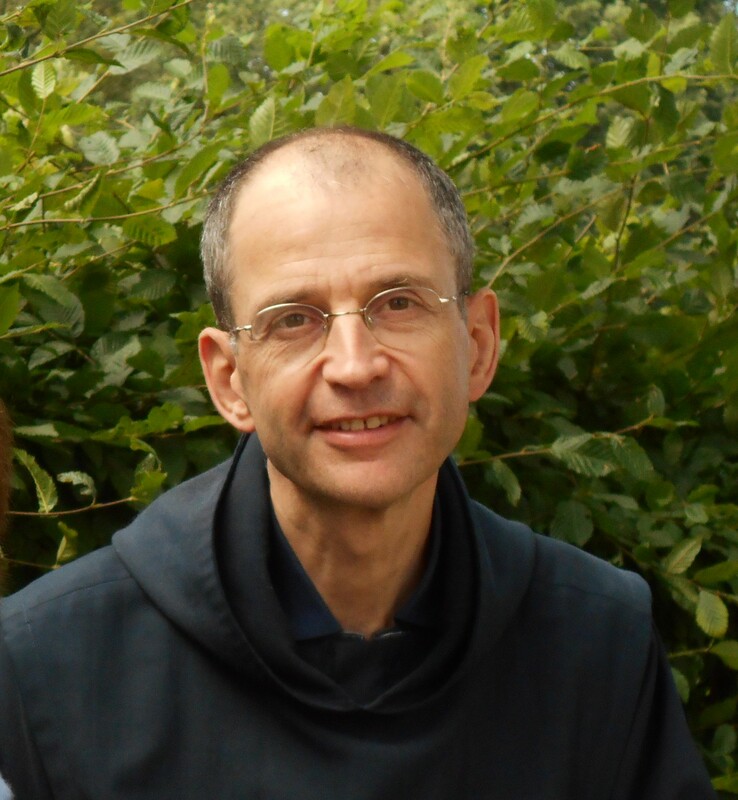 Before becoming a monk “in the heart of the cities, in the heart of God” in the community of the Monastic Fraternities of Jerusalem, in Paris in 1989, Brother Antoine-Emmanuel was a telecommunications engineer. Ordained a priest in 1994, he was elected as Prior during the foundation of the fraternity of Strasbourg in 1995 and again in Florence in 1998. Originally from France, he made Quebec his home base in 2005 when he became Prior with the Fraterniy of Montreal located in the borrough of Plateau Mont-Royal. In 2016, he joined the new Maison de prière de Mont-Saint-Hilaire. Since 2017, his mission is in Italy; brother Antoine-Emmanuel is Prior of the fraternity of Florence. Ordained as a priest on June 8, 1968 in the Diocese of Sainte-Anne-de-la-Pocatière, Yvon Joseph Moreau entered the Cistercian Abbey of Oka in 1984. 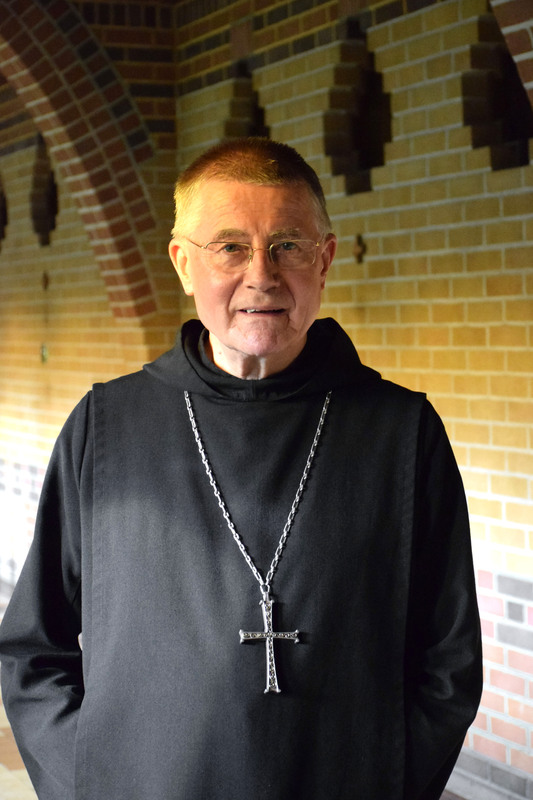 He was elected Abbot of the community in 1990. From 2002 to 2008 he accompanied his brother monks in the decision process for the transfer of the community and the construction of a new abbey in Saint-Jean-de-Matha. In 2008, he was called to serve his diocese of origin as Bishop. Since March 2018, he is back among his brothers at the Abbaye Val Notre-Dame. He is the author of three books on faith and prayer: Offrir Dieu (2012), Respirer Dieu (2014) and Écouter Dieu (2017) published by Médiaspaul. For the Dates marked by an asterisk (*), preaching will be held in the Basilica at 2 p.m.
Sunday March 10* God will welcome us at the end of the journey… Hold fast to hope! Monday March 11 God will welcome us at the end of the journey… He will accept us on the basis of our love! Tueday, March 12* God will welcome us at the end of the journey… You shall know His mercy! Wednesday, March 13 God welcomes us today… Return to Him with all your heart! Thursday, March 14 God welcomes us today… Knock on the door of His heart! Friday, March 15 God welcomes us today… Hurry! Reconcile with your brother! Saturday, March 16 Welcome God today… Under the guise of your brother, He awaits your love! Sunday, March 17* Welcome God today… Enter into the mystery of prayer! Monday, March 18 Welcome God today… Become like Him! *Preaching at 2 p.m. will be held in the Basilica. Regular Mass in French, from Monday to Saturday at 8:30 will be broadcast live on Salt & Light TV. The 9 a.m. Mass, celebrated by Father Thomas Rosica, founding Chief Executive Officer of Salt and Light Television, will be broadcast live on the web. The 7:30 p.m. Mass will be broadcast live on the Oratory’s Facebook page. The Blessed Sacrament will be exposed in the chapel behind the sanctuary in the Basilica on March 11, 14, 15, 16 and 18 from 10 a.m. to 4 p.m. 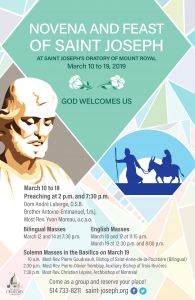 There will be no adoration on March 10, 12, 13, 17 and 19. March 10 : 12:15 p.m. and 3 p.m.
March 11 to 16: 12 p.m. and 3 p.m.
March 17 : 12:15 p.m. and 3 p.m.
March 18 : 12 p.m. and 3 p.m.
March 19: 12 p.m. and 2 p.m.